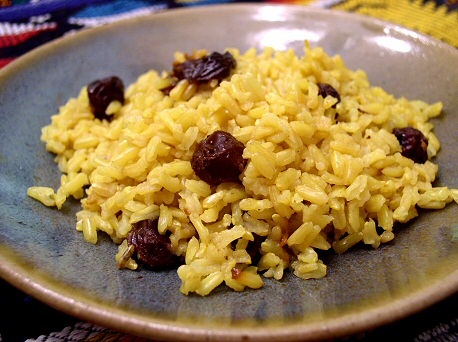 I adapted this from a Moosewood recipe that called for white basmati rice, and it was SO good. It’s very faintly sweet from the coconut milk and lightly spiced by the cinnamon stick. No leftovers left over! I’d already decided to make the coconut rice, but I also had a couple of kohlrabi in the fridge that I needed to use before they went bad. Well, I have almost no experience with kohlrabi, so I went to google and searched for “kohlrabi indian.” This was the first item that came up: Indian Inspired Kohlrabi. I had all the ingredients on hand, and it looked easy to leave the oil out, so I went for it. My kohlrabies must have been tough because it took longer than the recipe said for them to cook. Also, my biggest tip about kohlrabi is make sure you peel it deeply and thoroughly: we were spitting out fibrous pieces of skin every few bites. Yuck! I may have to face the fact that I just don’t like kohlrabi too much; it wasn’t bad, but it didn’t really do much for me. I didn’t bother to take a photo. We also had some curried cabbage that I just threw together without a recipe. I started some garlic sizzling in a dry pan, threw some mustard seeds and madras curry powder in, added a little water and about 1/2 a head of sliced cabbage. Covered and cooked until tender. This was pretty good, but too spicy for my 8-year-old. The photo came out a funky yellow color, so I won’t bother to post it. Love the Coconut milk with the rice. It takes incredibly rich.